You really want to keep your yoga practice going, but your recovery from an injury or surgery may be keeping you away from class. Maybe it’s a knee or a wrist issue that keeps you from being able to do the table poses or downward facing dogs of which your teacher is fond. While using a chair to modify sun salutations and other vinyasa flows (think downward dog, upward dog, and lunges with hands supported on a chair) may help alleviate weight-bearing on the knees, there is still a bit of weight on the hands. A home practice series, like the one below, that is strong, vigorous, and flowing, with no weight-bearing on hands and knees, may be just what you need. After all, you want to be able to maintain your strength and flexibility without causing pain or harm to your body. I originally created this sequence for a friend with chronic knee issues who had recently had carpal tunnel surgery and was okayed by his doctor to resume yoga practice (with stipulations). We had fun finding variations that he could do with his current limitations, and we used different muscle groups than he had been using in his regular practice (which involved a lot of sun salutations). The intention of this sequence is to be (and remain) aware of each of your movements and honor what you are able to do today. 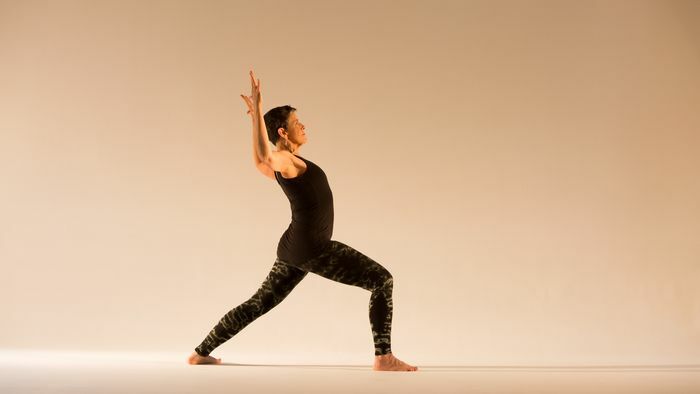 In this sequence, as with any yoga sequence, your aim is to honor your body’s current status—not push it back to where it was prior to injury/surgery. And remember that no two of us have the same exact experience recovering from an injury or surgery. If your knees are not comfortable in a deeper flexion, for example, take the bent-knee poses at a higher level with knees less bent, and focus on the strong support that these poses offer. Move slowly and pay attention to alignment. We are more likely to make jarring movements when we rush. The intention of this sequence is to be (and remain) aware of each of your movements and honor what you are able to do today. Although the arm positions in this sequence bear little or no weight, choose the options that feel best for you, and notice the ways you can feel strong while staying safe. 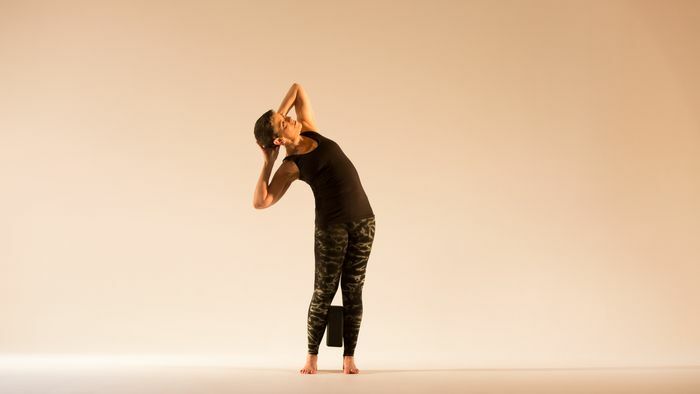 Exhale into a chair pose twist (parivrtta utkatasana), taking your left elbow (or hand/forearm for a less intense twist) to the outside of your right knee. Stay for three breaths, deepening your twist on each exhalation, and drawing your top shoulder back when you breathe out. 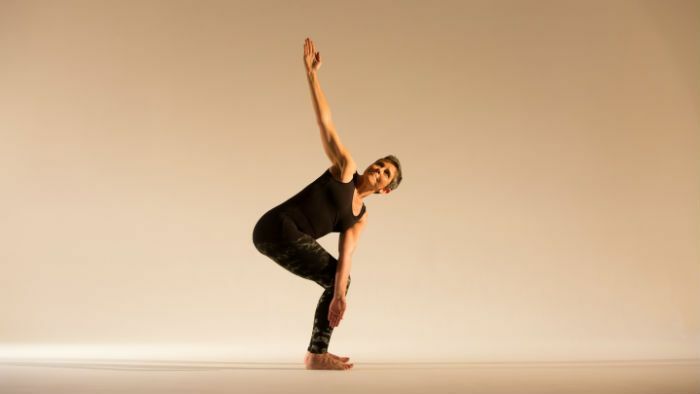 Then, step your left foot back into a revolved high lunge (parivrtta anjaneyasana), keeping either the elbow or hand/arm on the outside of your right knee. Again, stay for three breaths, deepening your twist with each exhalation. Try turning your head to look down toward the floor as you inhale, and move your gaze upward as you exhale. Next, spin your back heel down to come into virabhadrasana I (warrior I pose), with strong “goalpost” arms (bent at a right angle from the shoulders). Stay here, or extend your arms straight upward. Then bring your hands to your heart in anjali mudra (prayer position). Keep your front knee stable as you revolve to face the long edge of your mat for virabhadrasana II (warrior II). Expand your arms out from prayer to shoulder level, palms facing down. 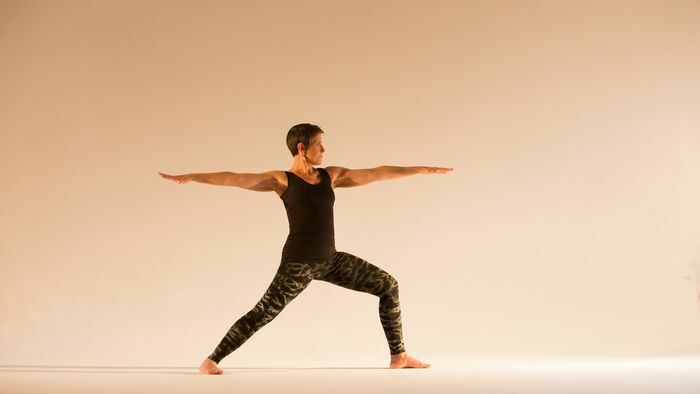 After your three breaths in warrior II, rotate your back foot out and your front foot in a little to come into goddess pose (a wide, high squat). Either make goalposts with your arms and twist from side to side (revolving at the waist while the pelvis stays stable), or, keeping your torso centered, make light fists with your hands and “lasso” your arms overhead (kind of like you're swimming the backstroke). Then bring your feet parallel and start to straighten your legs without locking your knees. Keep your knees slightly bent as you hinge forward into prasarita padottanasana (standing wide-legged forward fold). Lengthen your spine forward, and keep the weight evenly distributed on both feet. You can extend your arms forward, like downward facing dog, but keep very little weight in your hands. Or clasp your hands behind your back. Or hold your ankles (but keep your spine long!). After your three breaths, reverse direction. (Again, take three breaths in each posture so that you have enough time to make adjustments and refine your poses). Rotate your left foot out into virabhadrasana II (you should be facing the opposite direction now). Inhale arms out to a T. Then revolve with hands in prayer to virabhadrasana I, bringing arms either into goalposts or straight up. Then spin your back heel up for parivrtta anjaneyasana, with right elbow (or forarm, or hand) to left knee. 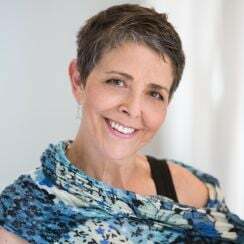 Step forward into parivrtta utkatasana, and finally, return to tadasana. 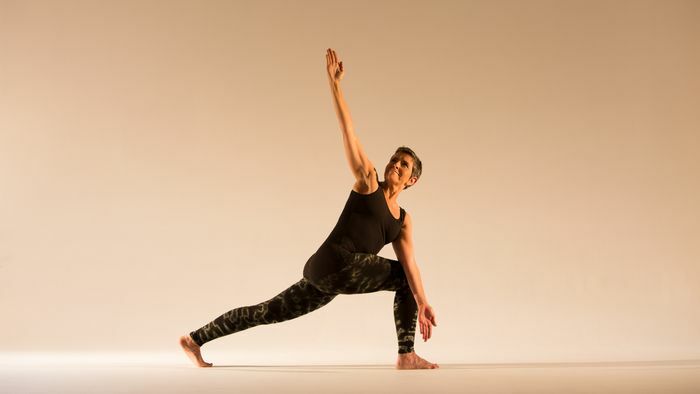 Follow this sequence with some standing lateral poses like crescent moon (chandrasana) (try a wider leg variation, or squeeze a block between your shins for extra stability) and a dynamic standing backbend. 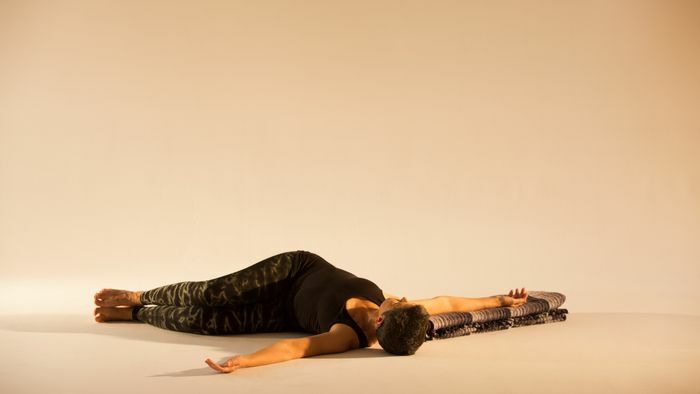 Finish with a reclining rainbow twist (resting on your left side with your palms, knees, and pelvis stacked). Let the hand of your top arm arch overhead and bring your arms into a wide T position. A folded blanket or bolster can support your back arm in the twist. Conclude with a supine forward fold like happy baby (ananda balasana), or clasp your arms behind your legs for a straight-leg, back-supported forward fold (viparita paschimottanasana). Then rest in shavasana (corpse pose). This is a rather strong series intended for practitioners with some yoga background. If you are recovering from an injury or surgery, wait the prescribed time before starting anything beyond physical therapy, and make sure you ask your doctor how deeply you can bend your knees and/or how much weight you can bring to bear on your joints or hands. And be specific! Your doctor may say “Yoga is fine!” assuming you are attending a meditation class, while you may be thinking of your power yoga class. Ask questions about what level of discomfort is okay, and what you should avoid altogether. Relearning movement is a challenge and a practice in itself. The investigative healing process is not about stepping down from a higher level of fitness or strength. It’s about learning to move smarter.